130X main blades "Replica" Edition are evolutions of the well know first edition. Why Lynx doing "bullet" main blade? What are the benefit flying that blade?? Adding a specific weight on the leading blade edge we can move the blade CG and get different blade timing position once is in fly condition. Moving CG and change the timing of the main blade we can than change the blade specification in terms of precision, reaction speed. Our "bulled" main blade was designed for fast fly performance, reducing a little the reaction speed compare the 3D Edition and give you more fly precision and more authority in wind conditions. 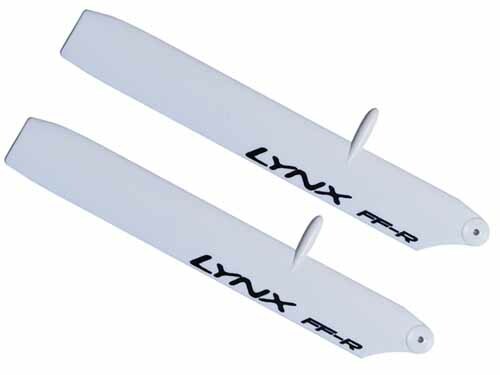 Thanks the great field experience Lynx made with first edition and our continuously perfection research, we redesign the profile, the centre of gravity position and we use new innovative compound that after many test, made our 130x Replica Edition Plastic blade one of the best plastic main blade on actual market. One more times Lynx redefine the standards with innovative products. Our design target was made 130X main blade that can bit the first edition style main blade, but the result surclass our expectation! once you try it, will hard go back to previous models! If you already tested the first edition you will amaze about the improvement was made in the "Replica" edition. - Extreme crash and wear resistance. The blades features incredible material stability that guarantees constant blade shape (no warping), even with extreme weather conditions (very hot, very cold). The result is a stiff blade giving the best helicopter performance under all conditions. When flying the Lynx 130X blades on your helicopter, you will immediately see the precision of the rotor disc and the resulting accuracy and agility during flight. Blade was designed and test to be flyable until 7000 RPM.